Yuan's elegant street style caught my attention as she confidently cycled through the busy College Street traffic. "My style is classic, vintage and chic," she said. Before packing away my camera, I couldn't help but also notice the many cuts and scraps on her arm and leg. Yuan: "It happened a week ago after I just returned home from my honeymoon. I bought these Havalanas flip-flops that were a little too big. As I was biking North on Dundas from Queen, one of my flip-flops slipped off and got caught in my bicycle chain. I lost control, keeled over and scrapped my whole right side. I cried like a baby." Yuan: "I'm trying to cover up my cuts in a creative way with my wardrobe now. I wouldn't normally wear this dress when it's so hot outside." TorontoVerve: "Were you wearing your helmet at the time?" TorontoVerve: "So I guess you're wearing a helmet today because you've learned from the experience." Yuan: "Yes, I try to always wear a helmet - plus it looks cute." TorontoVerve: "Did any good samaritans help you?" Yuan: Yeah, pedestrians really surprised me. Some people think that Torontonians don't care about each other. They got me water and a first aid kit. It was great." 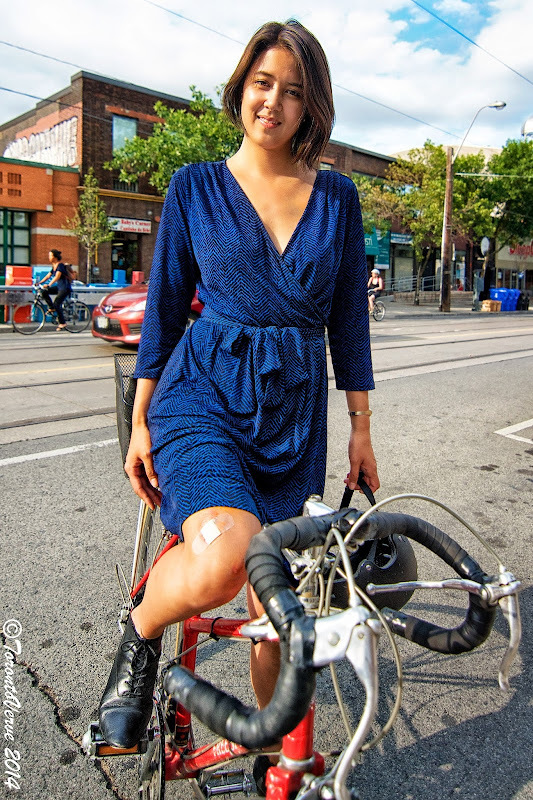 TorontoVerve: "Any tips for anybody wearing flip-flops on a bike?" Love it. Thanks for catching up to me that day! This blog is great.